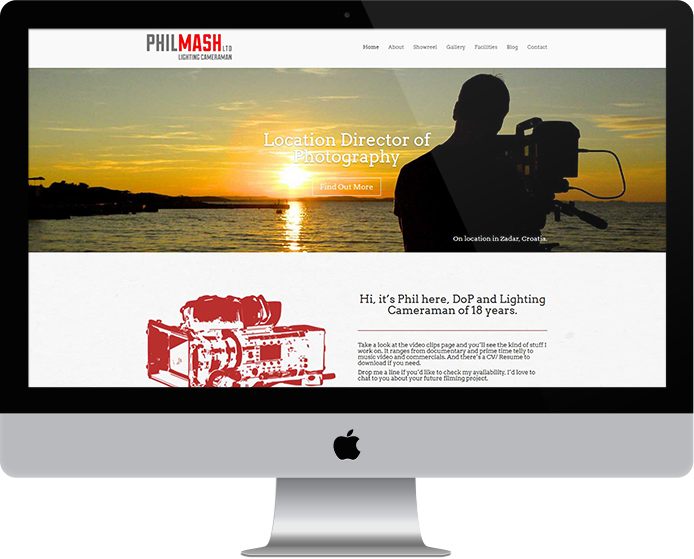 An independent lighting consultant and cameraman, Phil Mash has worked on a range of prestigious media projects which range from documentaries and prime-time television programmes, through to advertisements and music videos. Our brief was to create a new website that would showcase the highlights of Phil’s work in a way that was user-friendly but stylish – remembering of course that as a creative professional, individualism and quality were key. His preferred style was modern but with a retro feel. A separate mobile version of the website, for which we set up a sub-domain that was intelligently responsive, so it automatically directed users to the correct version of the site. In the media, image is everything. So it was vital to Phil that the visual style of the website was exactly right – it needed to blend fun, professionalism and individuality, so that Phil’s work and CV were presented in the best possible light. We had the benefit of some stunning imagery from various exotic and historic locations around the world, which we could also showcase to add to the impressive visual appearance. While the visual elements of the new website were striking, it was important to keep the navigation as intuitive and clean as possible, to deliver the best possible user experience. We ensured anyone visiting the site could find what they were looking for quickly and easily. The result of our work was an attractive and user-friendly, feature-rich website that provides a superb showcase for the best of Phil’s work.